Ever get tired of reading those spurious cinema histories that credit any number of films and/or personalities with saving their studios from bankruptcy? Lately, it’s been King Kong (no, not the recent remake!) that supposedly pulled RKO’s fat out of the fire (it did fine, but Rio Rita and Little Women did better, then Top Hat surpassed them all). We’ve also heard about Mae West, Deanna Durbin, Abbott and Costello, and the Frankenstein monster (poor Universal always seemed in need of fiscal rescue). Sometimes the real saviors go unheralded, never to claim the credit they so richly deserve. Such is the case with Bob Vaughn and Dave McCallum. 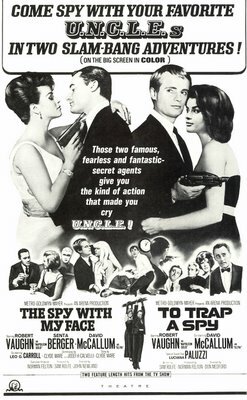 Now, some of us know Bob from the Ray Courts autograph collector shows, and who’ll ever forget McCallum as dreamboat secret agent Illya Kuryakin (with that lilting accent!). Actually, I think both these guys are tremendous actors (seriously), and it’s great to see them still working, but I must confess to having made a faux-pas with Bob the time I met him at a Courts show. Instead of seeking an autograph and telling him how much I appreciated all his work (and I do, Bob), this writer made the unpardonable error of asking about what it was like working with Boris Karloff in The Venetian Affair --- and nothing else. No questions about the Oscar Bob nearly won for The Young Philadelphians, his powerful titular role in Teenage Caveman (saw it recently --- not bad! ), and the grueling Towering Inferno shoot (wish he’d told Bill Holden to lose those ugly horn-rimmed glasses he sported all through the pic). I just got the dope on Karloff and walked away. They should have flayed me and driven me out of the Beverly Garland Holiday Inn in disgrace. Consider this my mea culpa, Bob, and apologies to you, profuse ones. Now about that salvation from bankruptcy. The studio in question was MGM. It was the latter half of the sixties. The mighty Leo’s mane had become tattered and mangy. The list of casualties in the field was appalling. Seven Women, Made In Paris, The Singing Nun, Hold On!, Lady L (three million lost on that one), Mister Buddwing, Hotel Paradiso, Penelope. We could go on --- and on. Even the Elvis shows lost money. Remember Spinout, Double Trouble, and Speedway? All of them came a cropper at the B.O. Hard to imagine how the place stayed open. But then wait --- someone had an idea --- an inspired idea. What if we pasted together some two-part episodes of Man From U.N.C.L.E and called it a theatrical feature? Sure it’s a cheater, but the chumps won't know until they’ve settled in with their Pom-Poms and Cherry Cokes. By then, we’ve got their sucker money. 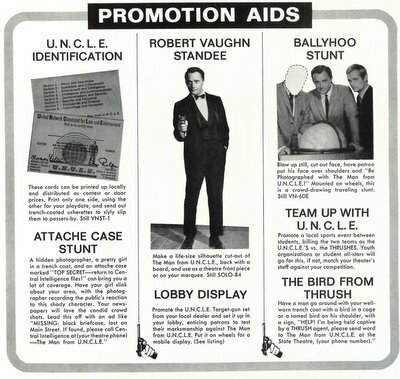 It’s better’n a carnival scam, and with all those two-part U.N.C.L.E episodes piling up from TV, this thing can go on forever! Funny thing is, it very nearly did, cause believe it or not, there were eight of these pics. Three released worldwide, and five distributed in foreign territories only. And dig some of those crazy foreign titles --- How To Steal The World, The Spy With The Green Hat, The Helicopter Spies, among others. But here’s the kicker. 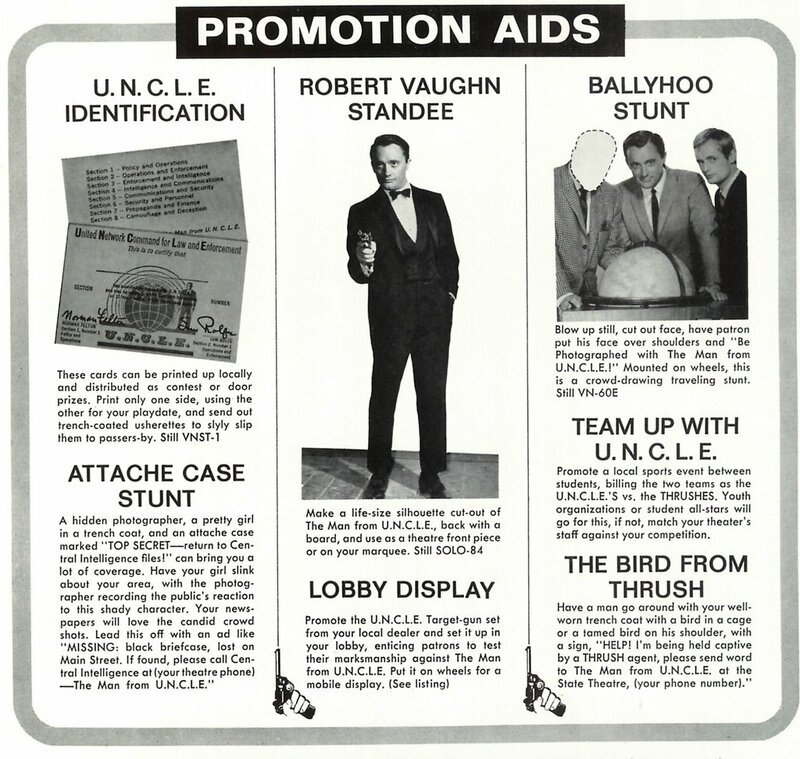 All but two made a profit (there is such a thing as going to the well too often, even with an U.N.C.L.E paste-up). A friend of mine caught The Spy With My Face in a grindhouse around 1966. He and his buddy entered the theater in good faith. After about ten minutes, my friend’s companion tumbled on to the deception. Son of a b---h! I saw this a month ago on television! Well, you should have examined the one-sheet more closely, said their friendly exhibitor. Sure enough, there it was. The disclaimer. Two Feature Length Hits From The TV Show. Case closed, and after all, these boys were only sixteen. They knew from nothing about semantics, but you don’t have to be an adult to know a skunk after he’s sprayed you. Yes, the incident was filed away, but never forgotten, nor forgiven. My friend carries the scars to this day. MGM made a bushel of profit on these rip-offs. In legal circles, they call that unjust enrichment. A whole lot of kids got duped. I know I did when I went to see One Spy Too Many (which, incidentally, brought in three quarters of a million dollars in profit). The only saving grace was that I had missed the TV episode from which it was "adapted", so the whole thing was new to me. I guess in a way you can’t blame Metro too much. Desperation makes scoundrels of us all, and the U.N.C.L.E’s really were the only sure thing they had for a while. Let’s imagine for a moment that we're hapless exhibitors trying to make heads or tails of this "promotion aid" you’re looking at. By all means, click and enlarge. Only then does the full weight of it’s absurdity settle upon you. First note the attache case bally. That’s where your usherette gets to "slink" around town, "slipping" U.N.C.L.E identification cards to passerbys. Wouldn’t be long before you’d have police involvement if they tried that one today. How about the man "going around in a trenchcoat with a tamed bird on his shoulder." That would be good for a thirty-day psychiatric commitment. As far as that sign he’s carrying, HELP! I’m being held captive by a THRUSH agent, please send word to the Man From U.N.C.L.E. at the State Theatre. Well, we’ve got a thing called the Patriot Act to address that kind of tomfoolery. Oh well, as old Pete says in Nightmare Alley, it’s all smoked meat now. No more stunts like this today, and more’s the pity. I do wish I had one of those U.N.C.L.E. membership cards, though. Thanks for mentioning MAE WEST. Hey, big boy! Come up and see Mae. I thought those movies were a success simply because most people didn't see them on TV in color..the same principle behind the MCHALE'S NAVY, MUNSTERS, and BATMAN theatrical films (of course the first two were never in color).